Won’t Lifting Weights Make Me Big, Bulky and Fat? Lifting weights makes you stronger. 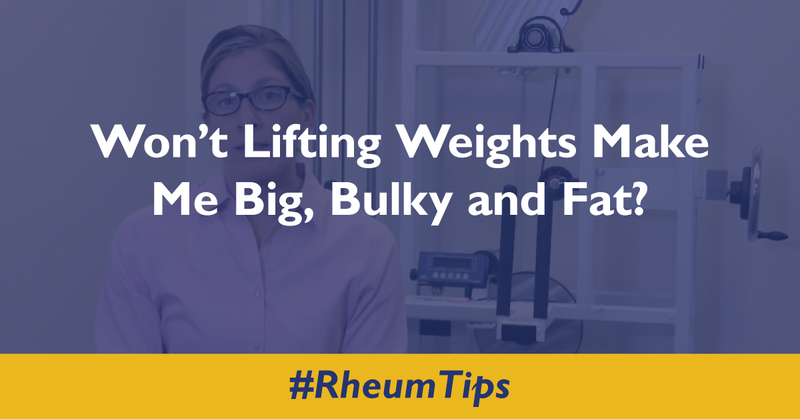 You will gain muscle the longer you lift weights, however, this is a good thing. Gaining muscle means losing fat. Gaining strength will help you to improve your ability to do things in every day life. When you lift and gain muscle, you will get stronger, fit, more active, and have more energy. 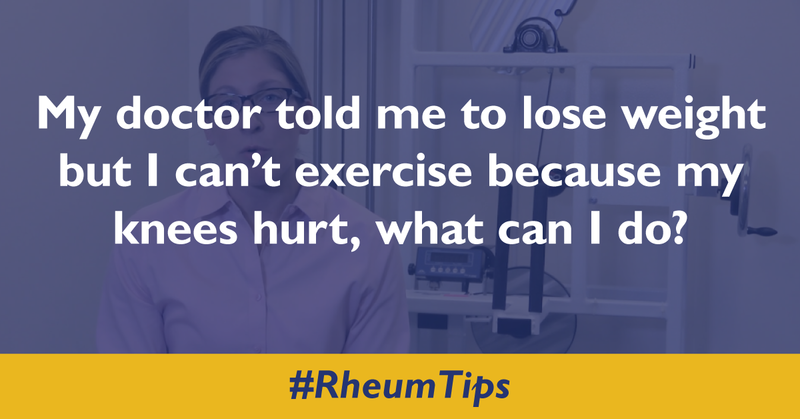 Make sure to talk to you provider before beginning a workout plan. To give your immune system the best chance to fight off viruses it is important for patients with a weakened immune system to get vaccines. The flu vaccine takes approximately two weeks to begin working. There is a new pneumonia vaccine called the PCV-13 and is highly recommended. This is used in combination with the old vaccine. If you need to have a live vaccine, get it before starting a biologic medication. You cannot receive a live vaccine after starting biologics. Live vaccines include shingles, flu mist, measles, mumps, rubella, yellow fever, and other childhood vaccines. 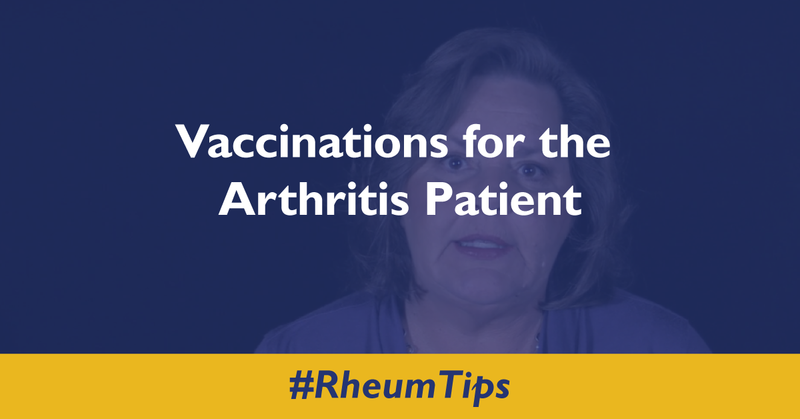 To give your immune system a fighting chance with inflammatory arthritis such as psoriatic arthritis, rheumatoid arthritis, or ankylosing spondylitis, it is important that you get regular vaccinations and stay up to date with them. The flu vaccine should be received yearly. Your flu vaccine should be the injected vaccine; this does contain a live virus. The injection is in your upper arm, and is available most everywhere. You can get your flu shot at your doctor’s office, pharmacies, and vaccine clinics in some malls. Check around your area to see what is available. A common opinion with the flu injection is that you can get the flu from the vaccine, this is just a myth. 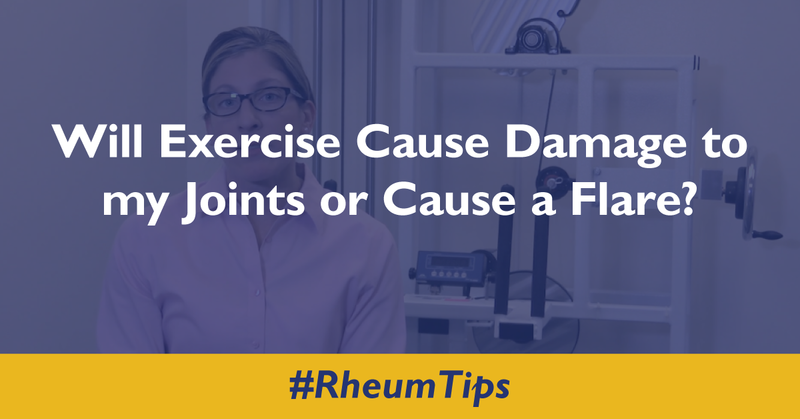 You may however, have aches, pains, and soreness at the injection site. In rare cases, you may get the flu directly after getting the vaccine if you were exposed to the flu before getting the vaccine. It typically takes about two weeks for the vaccine to start work against the flu. The Pneumonia vaccine, also called the PCV-13 is a newer pneumonia vaccine. If you had a pneumonia vaccine in the past, it may have been the PPSV-23 vaccine. Check with your doctor to see if you should get a booster of the new pneumonia vaccine. Two live vaccines of importance are the Flu mist, and the shingles vaccine. The Flu mist is a nasal spray that contains live components of the flu, this is why it is recommended to get the flu shot if you can. The next vaccine, the shingles vaccine or zoster vaccine also has live components of the virus. It is common for people to become more susceptible to shingles with age, or if someone is immunocompromised such as those with inflammatory diseases. If you get the shingles vaccine, please do so before starting any biologic medications. You should not get a live vaccine while you are on a biologic medication. Other live vaccines to avoid while taking biologic medications are yellow fever, measles, mumps, rubella, and other childhood vaccines. There isn’t too much concern with being around family members who have received live vaccines, however, just be aware and use proper handwashing. If you have any questions about vaccines please talk to one of your providers. 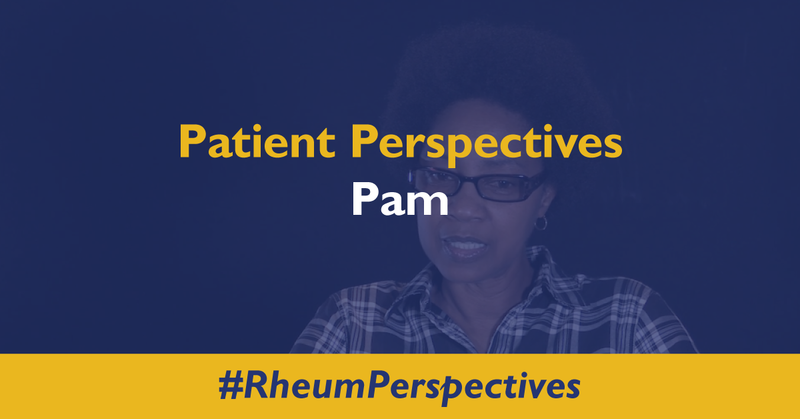 Pam shares some thoughts on working with the team at the Arthritis Center and the importance of research to her and others. The risk of infection is increased due to the medication changing the way your immune system works. Allergic Reactions are possible. Contact your doctor or nurse if any of these happen. Shortness of breath, chills, redness, itchiness, itchy eyes, or itchy lips for I/V infusions. Redness, itchiness, warm and tender to touch, and the possibility of a full body rash for injections. Central nervous system symptoms such as sudden vision problems, or any new numbness or tingling. Cardiac reactions including sudden swelling of the ankles, shortness of breath, swelling of the hands or sudden onset of heart failure which sometimes can be linked to medications aggravating previous conditions such as COPD. Lupus-like syndrome. If a rash starts across your face and arms that gets worse when exposed to the sun, and you have new joint and body pain let your provider know immediately. One of the biggest questions we hear from our patients relates to the side effects of their medications. 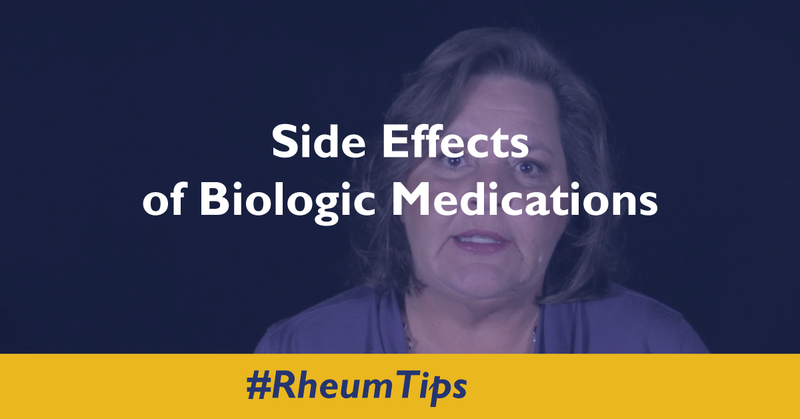 Here are some common side effects that you should know about with biologic medications. A main side effect of biologic medications is serious infection. Most likely, these infections are not because of the medications themselves, however, biologic medications change the way your immune works. Biologic medications help to control your inflammatory disease but also affect your natural ability to fight off an infection. If you get an infection while taking a biologic medication, you should let your doctor know right away so it can be treated. While on an antibiotic, you will likely pause your biologic medication until your doctor says you are able to resume your treatment. Another possible side effect patients can encounter when taking a biologic is the re-activation of certain diseases like Hepatitis B or TB. Your provider will do bloodwork to look for past exposure. Theses diseases will be treated before beginning a biologic. Some individuals can experience allergic reactions to their biologic medication. The types of reactions can vary depending on how you receive your drug. Infusions are performed through I/V where the drug is delivered through a needle in your vein at an infusion center. Allergic reactions with a biologic infusion may result in shortness of breath, chills, redness, itchiness, itchy eyes, or itchy lips. If your medication is given through an injection, you may see a reaction at the injection site where they needle puncture is. Symptoms of injection site reactions are redness, itchiness, warm and tender to touch, and the possibility of a full body rash. If any of these symptoms start please let your nurse or provider know immediately. Other, less common side effects that can occur with biologic medications are possible central nervous system disorders, cardiac issues, and Lupus-like syndrome. Central nervous system reaction symptoms that can occur are sudden vision problems or any new numbness or tingling. Cardiac issues might include exacerbation or a sudden onset of heart failure. If you have sudden swelling of the ankles, shortness of breath, or swelling of the hands let your provider know immediately. Your provider will take a look at the medications and see what could be the cause, some medications can aggravate things like COPD and make them worse while on the medication. Lupus-like syndrome is another immune disorder that can occur when taking these medications. If a rash starts across your face and arms that gets worse when exposed to the sun, and you have new joint and body pain this could be a sign of Lupus-like syndrome. Please let you provider know if you develop any of these symptoms. While these side effects are not common, they can still occur. It is important that you know what to look for to prevent any long-term side effects. Nutrition – Having a nutrition plan is just as important as exercise. See a dietitian to talk about the nutritional aspect of your weight loss plan. Exercise – Along with nutrition, it is also important to have an exercise plan that is right for you. You can increase your exercise plan in terms of intensity and length as you begin to lose weight from the nutrition side of your weight loss plan.